It took Alekos almost 3 years to complete his new CD " Mergin’ ". 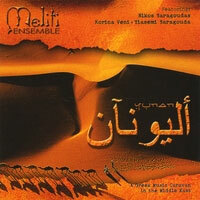 The music is a clever mix of Arabic, Jazz, Latin and Greek elements, a World-Jazz genre if you please. Traditional instruments like the oud, the violin and the Nay vs the piano the drums and the saxophone bring out all of the flavors that are mentioned above plus the great playing merges those flavors together. The reason for this delay was that Alekos was determined this time to do it on his own terms. He used friends instead of session musicians like Basam Saba, who flew all the way from New York to Athens just to play in this CD. Takis Paterelis, Serapheim Mpelos, Konstantina Kyriazi, Dimitris Sevdalis, Kiki Bu, April Centrone, Giorgos Roulos were delighted to play in the CD and had a ball. Great improvisations and music playing with the out most artistry is the basis for this work by Alekos. It took a long time for me to record again. Due to the financial situation in Greece, and the world in general, I was stranded. I saved up and we went into the studio in September 2013. We had a lot of fun. It was a good recording and we really enjoyed recording the pieces that we had been playing live for the last couple of years. This time around, I wanted to record some new tracks of mine, plus some great pieces by friends, that they so graciously offered me. Pieces by Gilad Atzmon and Ara Dinkjian were among some and one of my favorite pieces by Anouar Brahem. A back to the roots piece we did with the traditional instruments that are interpolated in the record was a Lebanese traditional known as Lamma Badda Yatathana. I always wanted to record this one and I took it even further, re-harmonizing it to my taste. Three pieces are my compositions and I�m very happy the way they turned out. Dimitris Sevdalis, Dimitris Christopoulos and Dimitris Klonis, who are the base of this ensemble, took the pieces to a higher level with their skill and musical initiative. Things turned out for the best and I�m proud to say that I really like this work. I had fun and enjoyed the whole process of making it. Since my financial state was a mess, Spiros Kassimis and I had a long time to mix and edit with no one pushing for deadlines and such (benefits of the indie production!). We took it slow and Spiros did a great job mixing and editing this fine work. This recording was inspired by my son, Kostantis, who I used to put on top of my piano and played to him so he would fall asleep. It worked every time. K (short for Kostantis) on top of the piano is the composition that bonds me with my son. It is the first work for him and from him out of many to come. I love seeing him grow. Reminds me of things I had forgotten over the years.